Because division champions from 1994 are unofficial, the Atlanta Braves are officially credited with winning 14 consecutive division titles from 1991 to 2005, winning the NL West in the final three years of the two–division system and then winning 11 consecutive NL East titles from 1995 to 2005. At the time of the season's cancellation, however, the Braves were in second place in the NL East at 68–46, six games behind the Montreal Expos. The 11 titles from 1995 to 2005 are an MLB record nonetheless. The Braves had a 2½ game lead over the Houston Astros for the NL wild card at the time the rest of the season was canceled. The Associated Press writers, at the end of the aborted season, chose to name "unofficial" champions when naming their Managers of the Year as Felipe Alou of the Expos and Buck Showalter of the Yankees, who were leading when the season abruptly ended. The next season's All-Star Game managers are, by tradition, the managers of the previous year's league champions; and so the leagues chose to name those unofficial league champion managers of 1994 to the traditional honor of managing the 1995 All-Star Game. 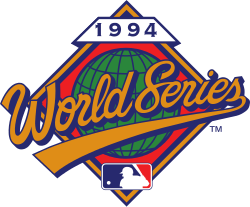 The 1994 World Series was scheduled to air on ABC, in the first year of a six-year-long joint venture with Major League Baseball, ABC, and NBC called "The Baseball Network." Because this Series was cancelled, ABC and NBC shared broadcast rights to the 1995 World Series, after which the joint venture was ended, and Fox started televising MLB games the following season. Fox and NBC would alternate World Series telecasts from 1996 up to 2000, after which Fox held exclusive rights to all subsequent editions. The 1994 World Series was supposed to have the AL champion open at home for the second year in a row because the playoffs were expanded to include the new wild-card round. Up to 1993, the NL champion opened the World Series at home in even-numbered years and the AL champion in odd-numbered years; 1994 reversed this pattern. Even though the AL missed having home-field advantage in the 1994 World Series, the NL champion was granted home advantage in 1995, as would have been the case had the 1994 Series occurred. From 1995 to 2002, the NL champion had home field advantage in odd-numbered years and AL in even-numbered years. Beginning in 2003, the league that won the All-Star Game had its champion open the World Series at home. ↑ Lupica, Mike (October 22, 1994). "Empty Feeling". Newsday. p. A42. The World Series was supposed to start tonight. ↑ Walker, Ben (October 23, 1994). "Game 1 of World Series passes by". Associated Press. Because of the expanded playoffs, including the new wild-card round, the World Series schedule had been flipped this season to open again at the home of the AL champion.